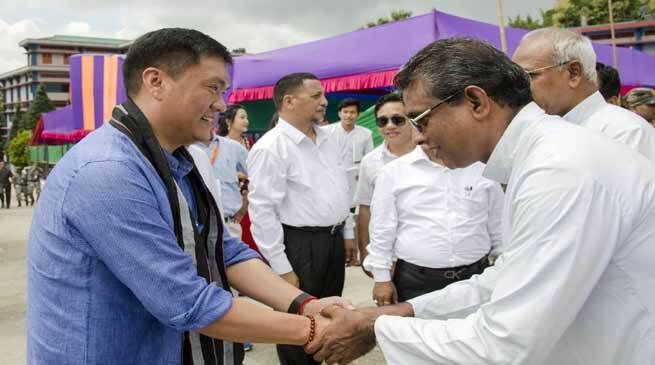 Chief Minister Pema Khandu today lauded the Christian missionaries for playing a major role in contributing to the growth of education sector in Arunachal. The Chief Minister was inaugurating the Don Bosco College annex here in Jollang at the college campus. The construction of annex was funded through the corpus fund of Rs 5 crore, which was sanctioned by former CM late Dorjee Khandu for the institute. In his address to the college faculty members and the students gathered, the Chief Minister commended the service of Christian missionaries especially in taking education to the poorest and the downtrodden. He also appreciated the contribution of the RK Mission and the VKV in educational upliftment of the state when there were no proper motorable roads in the state. Acknowledging the contribution of these missionaries, the Chief Minister assured the support of the state government to all those institutes that had contributed towards strengthening of education in the state. He also pledged his continued support to Don Bosco youth centre for its contribution towards skilling of youths in the state. The Chief Minister congratulated the Don Bosco institute fraternity for the exemplary performance by its students in all competitive exams achieved during the previous consecutive years. He also admired the college’s commitment to discipline, appreciating the culture of wearing uniform being followed in the college. Further addressing the grievances of the institute, the Chief Minister announced for a playground and a flood protection scheme for the college assuring to include these schemes in this current financial year. Taking note of NITI Aayog observation of declining quality education in government schools despite increase of assets and teachers, the Chief Minister informed that the state government is taking several steps towards achieving quality education. He said the state government is re-introducing the board exam system for Class V and IX. Through his effort and from various Chief Ministers for abolishment of no-detention policy, he informed that the centre is also re-introducing board exams for Class X and XII. Also speaking on the occasion, WRD Minister Kamlung Mossang thanked the Don Bosco institute for the affordable and quality education being rendered to the state. PHED Minister Bamang Felix in his speech said the Don Bosco institute would rise to become the epicenter for development in Arunachal. He said the education is the most powerful tool and the teachers the most powerful person. In his welcome address, Father Jose Chemrapathy recalled the contribution of late CM Dorjee Khandu and thanked the continuous contribution being carried out by the present CM. During the occasion, the guests were enthralled by the colourful cultural performances by students representing different tribes in the state. The Don Bosco School band from Palin displayed their talent in band performance. Earlier the newly inaugurated building had the blessings of Bishop of Itanagar, John Thomas, which was followed by a brief inspection of the facilities by the Chief Minister.